Pile of Pots: Drawing by Vera C.
To set up the exercise I gave a simple instruction to the class: Plan on doing two drawings. In the first, study the shapes and produce a representational drawing. In the second, take off and play with form, with a deliberate departure from representation. Of the seven students in the class, only two students followed this suggested program. Vera C. first produced a drawing in which the pots and drapery are recognizable as such (above). The style of drawing, with the soft contour and the arbitrary shadows, is already an emphatic departure from realism. 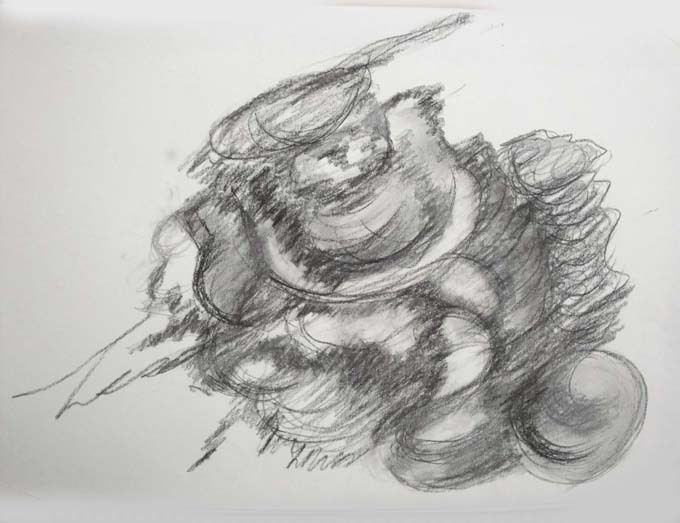 In the second drawing (below), she interpreted the still life as–what looks to me like—round objects caught in a tornado. It’s an apt image and it made me see this pile of familiar, oh so familiar, objects in a new light: the relentless roundness of the pots does have this hypnotizing effect and we know that on the potter’s wheel they are “thrown” in a process that is messy, relies on centrifugal force (notice the tangential lines in the drawing that suggests this centrifugal force) and also the centripetal, containing power of the potter’s hands. The other stuff on the still life table, the drapery can also be seen as evoking this swirling, vertiginous feeling. 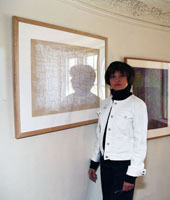 As in Austin’s drawing (see previous post), this drawing by Linné goes for huge. But with a crucial difference. Austin’s pots look monumental, Linné’s are just plain big. Austin gives us gravitas, Linné gives us humor. What’s so funny here? I’m not saying it’s a knee-slapping kind of funny, but I do think the high horizon lends wit to the thing. Mind you, he didn’t see a horizon, he saw a little table with a rumpled cloth and some pots. He invented the horizon. Now, the placement of the horizon in a drawing or painting gives us a crucial bit of information: it gives us the eye level of the observer. When you’re standing at the beach looking out at the water, the horizon will be as high as you, meaning your eyes; when you lie down on your towel, the volume of the water will appear to have shrunken down to a sliver because your eyes are now very low. 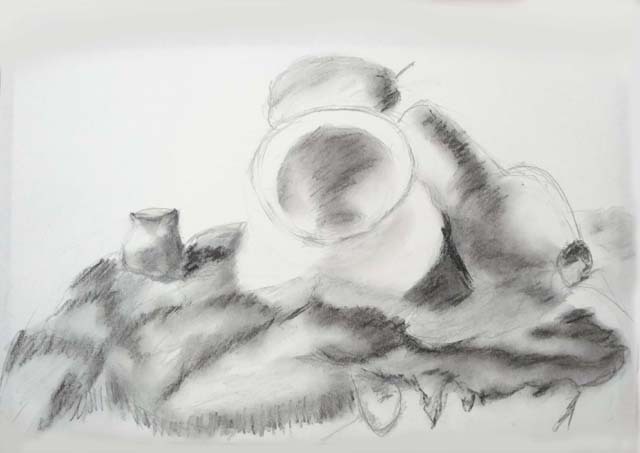 I’m reminded of the beach because Linné has invented not just any horizon line but the horizon of some ocean, “the wine-dark sea.” You know where you are in this drawing: you’re strolling on a beach and ahead of you is this enormous pile of crockery. How enormous? Since Linné, the artist “looking at this scene,” is about six feet tall, that pot leaning on the right is about six feet in diameter. The whole pile is about eleven feet high. It’s an intelligent and funny image–in a sneaky sort of way. It’s witty. 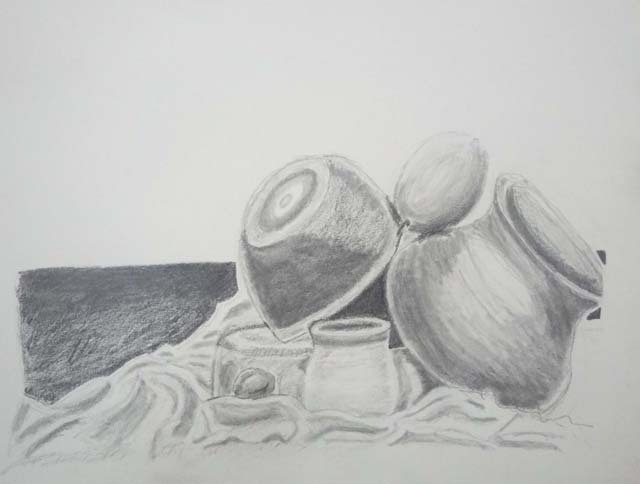 This is the fifth drawing from that still life of pots. In the next post, I’ll talk about what instruction I gave to the class as I was setting up the exercise. 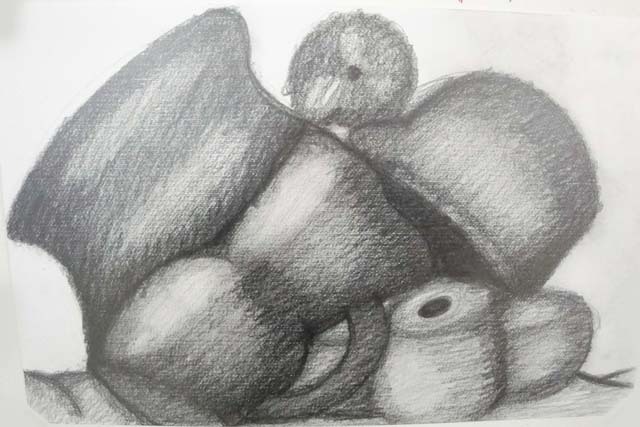 Pile of Pots: Drawing by Austin P.
She achieves this effect because 1) the forms are barely recognizable as pottery and 2) there is no reference to a familiar object that could serve to establish a sense of scale. In other words, Austin looked at those ordinary pots on the studio table and used them as a point of departure for a drawing of the kind of monumental forms that she produced in all the classes, even when the subject was a vase with flowers.